I just purchased a like new set of ping Isi nickel irons off ebay. I hit my previous irons off of a lie angle board with tape on the sole to get my lie angle dialed in. By cross referencing my lie angles to the specs on Pings Isi's I determined I needed a blue dot. I then hit a demo blue dot ping iron to make sure it was close. Just to be sure I called Ping and verified that if I need to fine tune these a degree or two to get exact my exact lie angle that they could adjust them and they assured me they could but recommended I send them into ping as these are cast irons and are not as easily adjusted as a forged iron. I replaced the zz65 shaft with Project x 6.5 shafts which are also the exact shafts I like and have to say I couldn't be more happy with my irons. They are large enough and have just enough off set that they offer forgiveness. I haven't taken the time to hit them on the lie angle board yet with the new shafts but will in the future and if i need to make an adjustment I will, although I really doubt I will have to. To make them even more awesome they are made out of nickel and beryllium which even though I don't feel it offers any effect on the playability it is sweet to play a 20 year old iron made out of these metals. I couldn't be more happy with these irons! There are a few down sides I would like to bring up. 1. This isn't really a down side but the lofts of these irons are weaker than a lot of new irons so your distances may be less. I would recommend spending a few sessions on the range without wind to find your distances. 2. If you are an exceptional ball striker the club head may be a little to big for your liking. I was previously playing a set of Titleist 690mb blade irons and I have to say I was able to crisp the ball easier than I can with these ISI's but when I made a poor swing the out come of the shot was so bad that I would take to overall out come of these ISI's all day long. I have hit Titlest Ap1 Ap2 Ping G20 King cobra f6 and with the correct shaft and lie angle for your swing these 20 year old irons are equal in performance. im 56 and have had at least 100 sets of irons. always looking for that magic wand. well about a month ago i stumbled on these irons. hit them in a net at the golf shop. they looked and felt sweet. i took them home to the range same feeling. the magic wand is finally here. they are so straight and accuracy is amazing. do yourself a favor and give them a try. after 42 years of searching ive found my irons. picked up a set of 3-sw becu with JZ Regular shafts. I have to confess to being a bit of a golfaholic and have a weakness for Ebay bargains. Anyway this summer I have discovered after switching to a regualr shafted driver that I may have been playing irons that are too stiff for my swing. I therefore picked up a set of regular shafted Ping ISI Becu'S, 3-SW in very good condition. I replaced the grips with Golf Pride midsize 2g tour wraps in white. I then de-banded the shafts as they were scruffy. Finally I soaked the heads in white vinegar and sea salt to remove the irregular patina, before darkening with a coppper darkening solution. so I have lost about 10 yards per club but can live with that as the benefits are ease of play and increased accuracy. I have played numerous irons, eye 2, eye 2+, ISI, i3+ blade, G20, I20, S57, S56,and too many other non Ping makes and models to list! I rate these up there with them some of my previous favourites, Titleist 735cm and Hogan FTX. Having gone through different Ping models over the years, I would rank these irons right between the Ping Eye 2 BeCu irons as the best irons I've played. They have a very distinct feel on impact and fly straight as an arrow. I started out with a set of Karsten I Pings, then to the EYE 2s, then to the Zings, Zing 2's and now the ISI irons. My favorite of all the aforementioned is the EYE 2's followed by the ISI's. Make sure you get fitted correctly and they'll make you a happy camper! 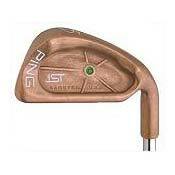 I have had my Ping ISI irons for fifteen years. I absolutely love them. Even with all the advances in technology since 1996, I can't get myself to even consider buying a new set of irons. As far as I am concerned, they are the best irons Ping ever made...all the way up to the latest G20s. I always wanted a set of these when they first came out but didn't want to spend that much money on a set of clubs. Recently I picked up a set on e-bay for $250.00 that looked about as new as you can probably find. I really was just getting them thinking I'd put them up and save them since the ISI's were the only clubs Ping made in nickel but when I went out and hit them I knew they were going straight in my bag. I don't know about the stainless or copper ones but the nickels are the closest thing to a forged blade as for as feel goes that I've ever hit but with that sweet buttery feel comes a price, hit them a little off center and you get that forged blade sting in your hands but without sacrificing the loss in distance or line hit on. They are incredable. I love knowing exactly where I hit the ball on the face so I can correct it. The problem with most clubs today is they feel about the same no matter where you hit them so you just go on your merry way not knowing what to correct. These let you know but like I said not at the cost of much distance or accuracy. I was thinking I'd probably have to go down a club such as instead of 8 iron for 150 7 iron but was surprised to say that they are just as long as any club I've played. My only complaint is towards myself and that's why did I keep spending so much money on all this new technology when I could have saved a ton of money and got these along time ago. It's also pretty cool playing a classic and rare club such as these. had countless clubs but none that really can compare to nickel ISI's These are by far my most favorite clubs ever owning. ISI steel were my first fitted set 10 yrs ago and after trying Callaways, Titleists and Mizunos in the mean time in the never ending endeavor to improve my handicap I have finally returned to my old ISI's. I impounded them from my son, who had inherited them and made him take my Mizuno mp 60s or else :-). Now that I can controll a golf ball a bit better I find these irons to be very, very forgiving and yet somehow you can move the ball right or left easier than any iron I have yet played. I love them and have asked my wife to forgive for having convincer her that I needed a new set of irons every two years. She still loves me and I love my old irons. They are cheap to find and I dont believe any new fangled contraption can beat the combination of basic cavity back forgiveness, good feedback and wonderfull playablity of these irons. Work on your swing, keep these irons in your bag and save a lot of money! Never needed it but I hear good things. As a long time (30+ yrs) Ping player I have owned at least 5 sets of Pings. cut thru the turf easily are easy the work both ways. They are also great from the rough. I have not tried the BeCu copper version but the Nickel have a very soft feel and are just as forgiving as any set I have owned. I have tried other shafts (JZ, DGS, Rifle Proj-X) but keep coming back to the Z-Z65, a lite weight shaft on the stiff side with a nice trajectory for me. I have tried/owned many of the other so called "new" technology irons such as Callaway, Mizuno, Titleist and Cobra and TaylorMade but still like the simple look and feel. Demo all the clubs/shafts you can then make your choice. I love these clubs. I got them as a gift when my brother in law told my wife someone had just returned a great set of clubs to the pro shop and she should pick them up for me for an X-mas present. Even though I do not play a ton of golf and really am still pretty inconsistent, I feel like these clubs just have a great feel to them, besides looking pretty cool. When I do slow down and concentrate I hit these clubs pretty straight and suprisingly long. 15 years ago or so, I drooled over the Ping becu ISI's but as a college student could not swing the price tag so I settled for "Z-Model" ping knock offs instead. I loved those clubs, but still secretly longed for the real thing. Last year I bought Ping G 10's and... meh... okay they were fine but still, I missed the old clubs. Well, nostalgia set in last month as I was on this very forum reading about the copper ISI's. My money scenario has drastically improved since college. Reading what you folks wrote about what I already knew of these clubs encouraged me to look on Ebay to, you know... just see if there were perhaps some green dot becu ISI's for sale. I nabbed them for $300! I just got back from playing Blackhorse here in Seaside, CA and I easily broke 90 with these clubs! (87 actually.. and it could have been 85 if I hadn't choked in the sand). I am telling you there is a huge difference in feel, feedback, accuracy with these. I marveled about why in the world Ping would have strayed so far away from this design. It's perfect. The clubs are perfect. Feel, so soft. The ball just jumps up and goes where you hit it. I was even able to work a couple of shots left to right with them. I am so glad I read the posts here about these irons. So glad I picked these up... I am definitely selling my G 10's.